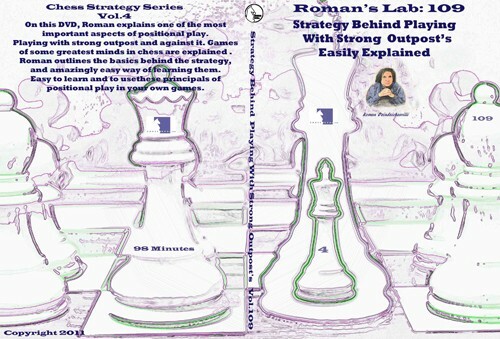 On This DvD, Roman explains one of the most important aspects of Positional Play Playing with Strong OutPost's and Playing Against Strong Outpost's Roman will take you step by step through games of the greatest minds of Chess. Explaining the basics behind the Strategy of outpost's. Roman presents an easy way to learn positional play for you to apply to your own games. Vol.109 Strategy Behind Playing With Strong Outpost's Easily Explained 98 Minutes Chess Strategy Series Vol. 4 On This DvD, Roman explains one of the most important aspects of Positional Play Playing with Strong OutPost's and Playing Against Strong Outpost's Roman will take you step by step through games of the greatest minds of Chess. Explaining the basics behind the Strategy of outpost's. Roman presents an easy way to learn positional play for you to apply to your own games.